We provide the market with the best heavy duty ball winders available. 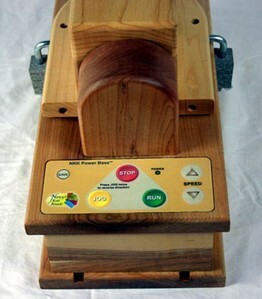 With over 6,000 sold since 2006, our units are recognized as the ball winders of choice for yarn related businesses. 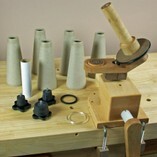 Our standard ball winder can be easily motorized with the addition of our Power Base. The Power Base is also made of Maple Hardwood and includes an intelligent motor controller with 10 speeds, reverse, foot pedal interface, and a Save function. It has the ability to connect to our Electronic Yarn Meter so that it can measure precise quantities of yarn and then turn itself off - all automatically! 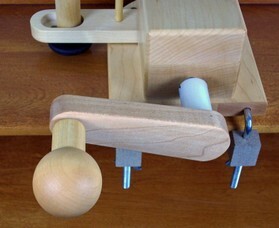 This means that you can be helping a customer or attending to some other task while the ball winder is winding yarn. Whether you choose to measure the length of yarn or just use the Power Base to wind your yarn for you, our Motorized ball winder combination is like having another employee on your staff. However, it doesn't require any ovetime pay, or coffee or smoke breaks. Just clean it once a year and replace the motor every three - four years or so (~$60) which you can do yourself. We estimate that over the life of a motor, the shop owner will wind between 15 - 20 million yards of yarn. That is equivalent to having a strand of yarn going almost half-way around the World! Will the motor break your yarn? Absolutely NOT! It is based on our unique design which automatically stops turning the ball winder whenever it senses excessive drag caused by a jam or other problem. Once the problem is resolved, it resumes turning. We guarantee that it will not break your yarn. We have many hundreds of motor drive systems installed globally and have never heard that any of them have broken anyone's yarn. (Update, at the 2014 TNNA show I broke some yarn that was a single (unplied) yarn which is a very rare event). If you ever speak to a yarn shop owner that has our system they will tell you to get one and don't waste another minute. Check the chatter on the Internet and see for yourself. 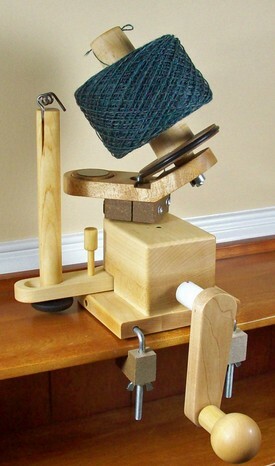 Sure, the Motorized Ball Winder costs hundreds of dollars, but how much did your computer cost or how much do you regularly spend to open a new yarn line ($3,000 - $5,000)? All for just a few hundred dollars! Really, this is the easiest decision that you will ever make in your yarn shop career so get on with it and order a Motorized Ball Winder. If you are a professional (Indie Dyer, etc.) then you also know that time is money. Stop wasting time and you will stop wasting money. Use our US made systems with 800 line support from an English speaking technician that is available 7 days per week. Where else will you get that type of service nowadays? Plus we have about 30 videos on our www.youtube.com/nancysknitknacks channel which will guide you through the maintenance and operation of most of our equipment. Want to check out our competition first? That's easy, we don't have any. But that doesn't mean we have been sitting around on our backsides! 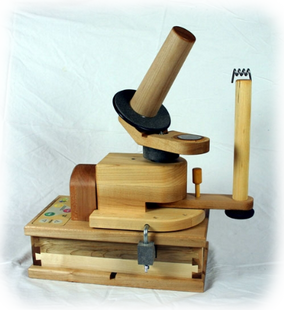 No, right after we finished the design of the motorized ball winder (which was 2 years after we designed the ball winder itself), we then designed the industry's first commercial electronic yarn meter (EYM). 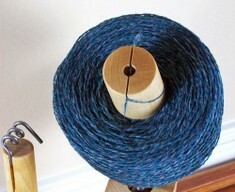 Then 1 year later, we introduced the Heavy Duty Swift and Skein-winder and then proceeded to add addition after addition to that product line. It is now fully motorized and meterized. Yep, even though we don't have any competition, we never stopped once after inventing the best ball winder in the market, we only kept refining it to make it better. When you select Nancy's Knit Knacks to provide your winding and measurement needs, you are selecting the best in the industry. So call us today and discuss your needs. We will more than likely have the winding and measurement solutions to meet your requirements.